Frosted glass roll-on bottles of fragrance blends or essential oils, in a light, fast-absorbing base. If you want a perfume oil made to match any of the scents that I have available for my soap, please contact me by email. 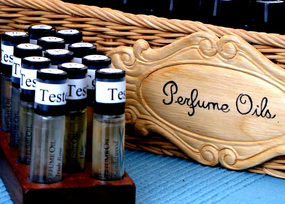 I do not attempt to reproduce commercial perfumes and aftershaves. Egyptian Musk - sensuous and calming, this dark Egyptian Musk oil blends notes of precious resins, flowers, and spices. Lavender - the finest Bulgarian lavender essential oil, in a carrier oil to use as a perfume. A relaxing, calming scent. Patchouli - made with mellow, well-aged iron-distilled Indonesian patchouli essential oil. None of my products are intended for the treatment of any medical condition. Please read labels carefully to avoid any known allergens and discontinue use immediately if any irritation occurs.